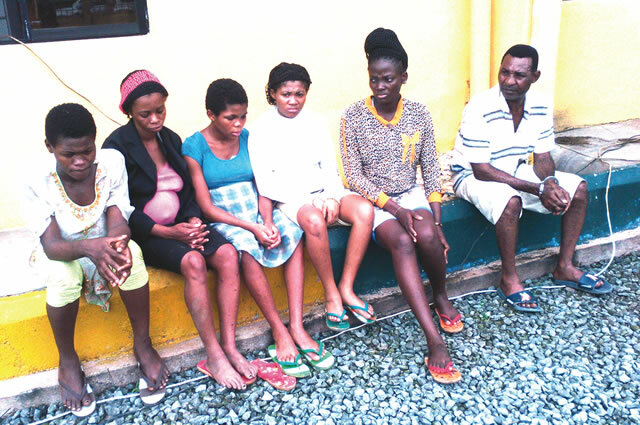 Police have uncovered a baby factory at the Ogbor-Hill area of Aba in Abia State and rescued five pregnant women. The police also arrested a 54-year-old man, Nkem Nwokocha and his wife, identified simply as nurse, who were said to be the owners of the baby factory. The pregnant women rescued includes one 29-years-old Chidinma Ifeanyi Chukwu, who hails from Isiala Mbano in Imo State, Kelechi Sampson, 20, and Happiness Godwin from Mboko Umuanunu village in obingwa, Abia State. Others are Okoronkwo Mercy, a native of Alayi in Bende Local Government Area and Oluebube Onyabu also from Umuanunu village in Obingwa Local Government Area of the state. While parading the suspects at the police headquarters in the state capital, Umuahia, the Commissioner of Police, Mr. Adeleye Oyebade, said the police acted on a report that the suspects were running a child trafficking home that led to their arrest. The police boss frowned at the rate at which people indulge in the illegal sale of children in the state, adding that it was an act of wickedness against children.